Observed growing on a downed tree trunk at Kakamega Forest, Kenya, Dec. 2014. 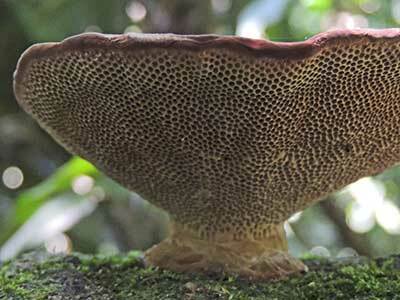 From Wikipedia: Polypores are a group of fungi that form fruiting bodies with pores or tubes on the underside. They are a morphological group of basidiomycetes like gilled mushrooms and hydnoid fungi, and not all polypores are closely related to each other. Polypores are also called bracket fungi, and their woody fruiting bodies are called conks. Most polypores inhabit tree trunks or branches consuming the wood, but some soil-inhabiting species form mycorrhiza with trees. Polypores and their relatives corticioid fungi are the most important agents of wood decay. Thus they play a very significant role in nutrient and carbon cycle of forest ecosystems. 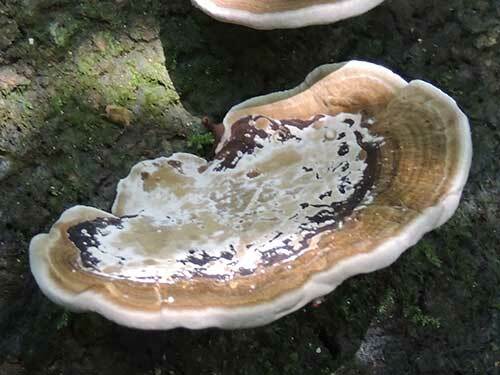 Over a thousand polypore species have been described to science, but large part of the diversity is still unknown even in relatively well-studied temperate areas. Polypores are much more diverse in old natural forests with abundant dead wood than in younger managed forests or plantations. Consequently a number of species have declined drastically and are under threat of extinction due to logging and deforestation. Removal of dead wood as for firewood is also a concern.